and announcing the sale of advance‐purchase tickets and annual passes. Opening in October 2011, LEGOLAND Florida will be a 150‐acre full‐day theme park geared specifically to families with children ages 2 to 12. There will be more than 50 interactive rides, shows and attractions including amazing LEGO® models making it unlike any other theme park in Florida. The ten different lands of LEGOLAND Florida are The Beginning, Fun Town, Miniland USA, Castle Hill, Land of Adventure, XTreme, LEGO City, Imagination Zone, Pirate Cove and DUPLO® Village. 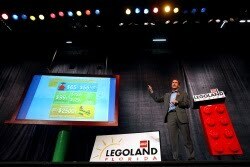 www.LEGOLANDFloridaResort.com with pre‐opening discounts. For a limited time, LEGOLAND Florida tickets are $65 for adults and $55 for children and seniors. Standard Annual Passes purchased now through the end of the year are available at the children’s prices of $99. A lifetime pass is available for $2,500 and is the perfect gift for the ultimate LEGO fan and includes unlimited admission, discounts on preferred parking, special events, plus discounts on food and merchandise.